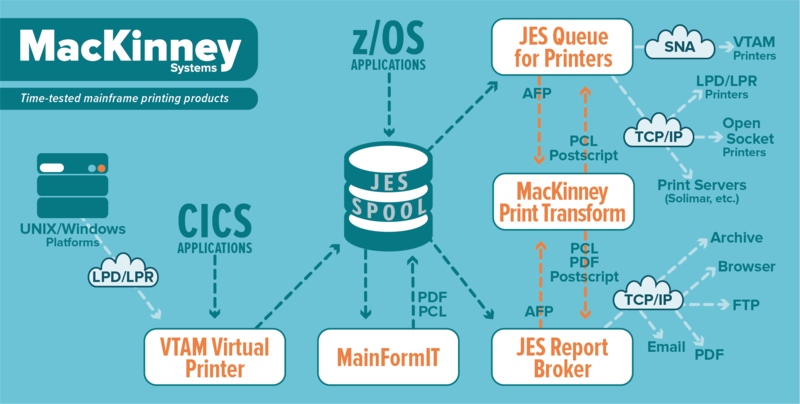 Reduce cost and better manage mainframe printing and output report distribution with time-tested products from MacKinney Systems. Take control of your printing needs and maximize your profit by sending reports where they need to be quickly and securely. Allow users to view reports with a web browser or receive them via email rather than printing and distributing paper reports. Archive reports to satisfy auditor or regulatory requirements. Interested in a free analysis to learn if migrating report distribution is right for your shop? Archive JES reports and view them quickly and securely with a web browser. Eliminate BUS/TAG printers by utilizing your existing TCP/IP network. Distribute reports via TCP/IP and VTAM printers, email or FTP. Eliminate obsolete and expensive AFP hardware with report conversions to PCL, Postscript and PDF. Capture the 3270-based data stream sent to a VTAM printer from any VTAM application (CICS, IMS, etc.) and create a report in the system spool. Offload, view, search, print, copy, archive and restore job/SYSLOG output. Replace and extend the functions of the standard CICS screen-print facility. Create intelligent forms and eliminate the cost of using preprinted forms. Accept reports from other operating systems (UNIX, LINUX, Windows, etc) via the z/OS LPD server.